Hi everybody! Welcome to another guest post. Carmen really wanted another post from me, but I was hesitant at first. I originally intended to write my post on Fable Kitchen as part of the Dine at Fable event, but that went nowhere as evidence by the lack of a post. 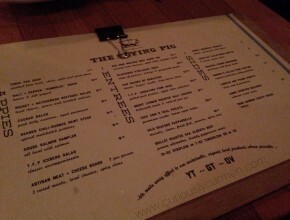 So here is a review for The Flying Pig, at their newest location in Olympic Village. Carmen had really wanted to try The Flying Pig for a long time, and one night we decided to visit the aforementioned location. This location does not have big signs or bright lights on the outside of the building, and it was quite difficult to locate in the dark. Once inside, we were greeted and seated promptly. The restaurant was about 75% full when we arrived, but I found that the table we were seated at was pretty cramped. Our server was very friendly, and rang off the specials of the day for us. 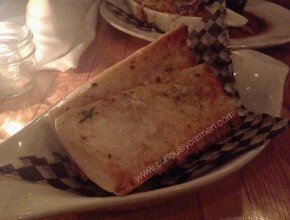 For an appetizer, we ordered the Bone Marrow Cheezy Bread. Carmen heard from a friend that the bread was a “must try” item, and it did not disappoint. It was warm, fluffy, and loaded with cheese. 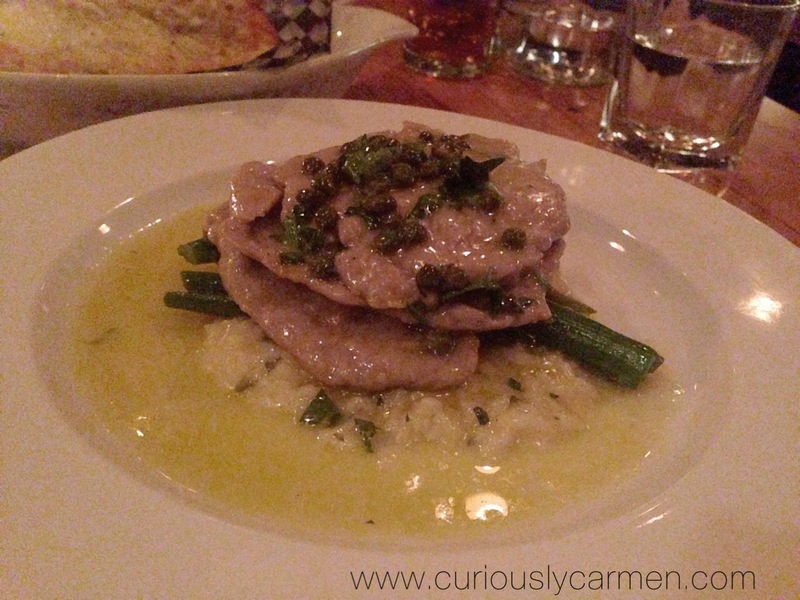 For her entrée, Carmen ordered the Veal Piccata. It consisted of a parmesan risotto in a lemon caper butter sauce, served with veal slices. The risotto was creamy and cooked perfectly, but that’s about as good as it gets. The veal, while tender, was underwhelming and bland. The lemon capers gave it an overly lemony taste, which required a lot of salt and pepper to mask. It also had a slimy texture that was very off-putting. Overall, Carmen did not enjoy it very much, and I switched dishes with her only because I could tolerate it a bit more. We both agreed, it’s not worth recommending. Next up is the entrée I selected: The Flying Pig Signature Pork Rack. It really sounded good on paper but was sadly another uninspiring dish. 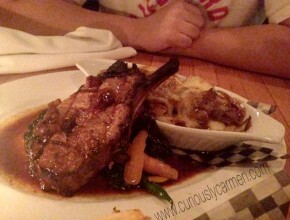 The pork rack consisted of one piece of pork chop attached to the bone, served with a side of pulled pork poutine, with an apple cider reduction sauce and seasonal vegetables. The pork was cooked very well, being very tender and juicy, but just like the veal, it was bland and poorly seasoned. Carmen tried a piece and was not impressed either. Sadly for this dish, the best part was the side of pulled pork poutine, which you can add as a side to other dishes as well. There was a generous amount of pulled pork layered on top, and the pulled pork was absolutely delicious. Considering how poorly seasoned the rest of the meats we had that night were, this was an absolute delight. There is also a generous topping of cheese curds and gravy. 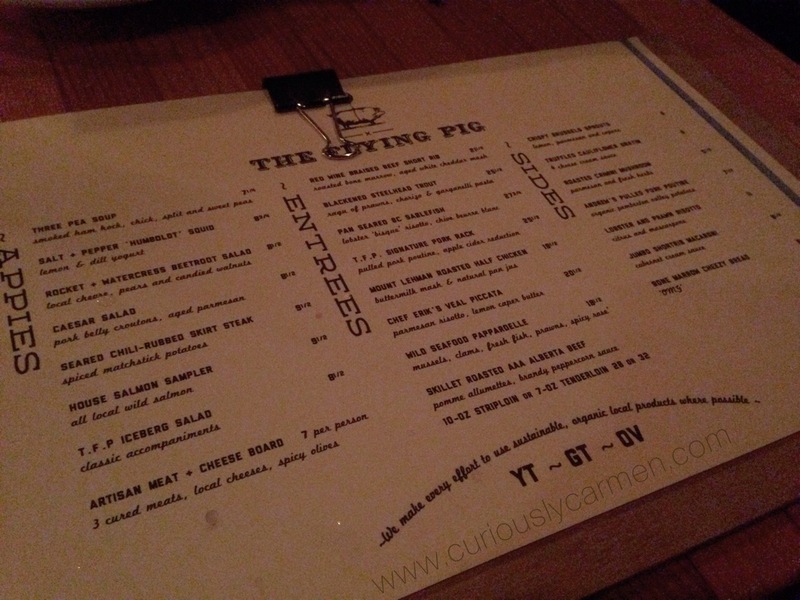 Our first experience at The Flying Pig was, overall, not a very positive one. Most of our food ended up being very disappointing, and for what we paid, we felt like it was definitely not worth the price. We also agreed that it would be worth revisiting another time. Carmen did in fact go back to The Flying Pig (albeit their Gastown location) and had a much better experience during their happy hour. You can expect that review to be up pretty soon after this one. Until next time, thanks for reading!